Rev Patrick Canon Shivers oversaw the beginning of 'St Joseph's Mission' in High Bonnybridge There's no photo, and the only reference found so far is a comment in the SVdP Treasurers' Book regarding 'To Sale of Canon Shivers P.Cards' 3/6 dated Feb 11th 1917. These may be memorial cards following the Canon's death. Fr Daniel Conway - 1910-1922 Firstly curate to Canon Patrick Shivers and then Parish Priest for 12 years. Very Rev Michael Canon Downie - 1928-1938 - curate Rev Patrick Quille 1938-9Born 1896 in Kilkenny, ordained 14/08/1921, served in St Patrick's, Edinburgh; St Mary's, Stirling; St Joseph's; St Patrick's, Kilsyth. Died 24/14/1955 - buried in Kilsyth.Fr Downie was the priest who persuaded Dr Thomas Reilly to set up practice in Bonnybridge. Photograph and information contributed by Mr Michael Hope. Fr Callaghan in a pose with St Joseph's Boys Club football team - 1937. 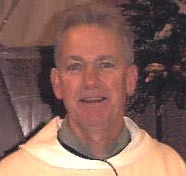 Fr Callaghan was a visiting priest from Ireland. 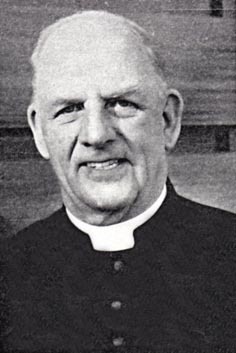 Father William Ferguson - curate 1958-1965. 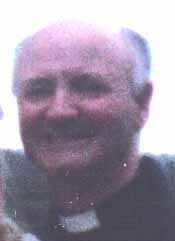 Fr Daniel Boyd - 1999-2000. Born in Stenhousmuir, schooling at St Francis', Falkirk and St Modan's, Stirling. Trained at Drygrange and ordained in 1961 along with Fr Agnew (above). Curate in Edinburgh for two years then trained in Canon Law in Rome. Worked in marriage tribunals and did some teaching in Drygrange for four years. Worked as curate in St Machan's, Lennoxtown under Canon McCabe (above) until 1979 when the Canon died. Was sent to Torrance to re-establish the parish of St Dominic's until his transfer to St Joseph's in 1999. Fr Basil Postlethwaite - 2000-2004 - comes from Warrington & was educated in Manchester; he joined the Benedictine Abbey at Ampleforth and was given the name Basil; he took a degree in History and Economics at Oxford. In 1981 he came to Edinburgh and worked with Fr Jock Dalrymple. He was ordained on December 3rd 1983. In August 1985 he went to St Mary's Stirling; May 1986 to St Margaret’s Gorebridge & then back to St Mary’s and Chaplain to St Mungo's. In 1989 he went to El Salvador where he became Parish priest of Dulce Nombre de Maria. In February 2000 he came back to Scotland and was appointed Parish priest of St Joseph’s. Fr Paul Kelly - 2004-2009 Studied history at Oxford for six years, worked for several years in the University of London and came to Scotland in October 1974 to work as an Assistant of Keeper of Manuscripts in the National Library of Scotland, then fell under the influence of the late Fr Jock Dalrymple and Fr Pat Fallon at St Ninian’s in Edinburgh, studied for the priesthood in Rome (1981-85) and was ordained by the late Cardinal Gray at St Ninian’s in 1985 – Fr Basil organised the ordination! Went to Bathgate as assistant priest, 1985-1987 and St Margaret’s, Dunfermline, 1987-92. At Dunfermline he was also chaplain to both the primary and the secondary schools, and extra-mural lecturer in philosophy at Gillis College. In 1992 appointed Parish Priest of the combined parishes of St Luke and St Anne, Mayfield, and St Margaret, Gorebridge. In the year 1998-99, he did further training in spiritual direction at the Institute for Spiritual Leadership in Chicago. For a five-year term as Director of Studies in the National Seminary at Scotus College, Bearsden. Fr Kevin Dow - 2009 - 2015 Studied at Scotus College, the national seminary in Scotland, based in Bearsden. Ordained priest by the Archbishop on the 27th June 2003 in St Mary’s Cathedral, Edinburgh. His first appointment as a priest was to the Cathedral where he was based for a year before being appointed parish administrator of the parishes of Ss Luke & Anne, Newbattle and St Margaret’s, Gorebridge in Midlothian. His last appointment before coming to St Joseph’s was as Parish Priest of H Our Lady & St Bridget’s, West Calder and St Thomas the Apostle’s, Addiewell in West Lothian.